Bacon Jam has been around for a while on these here Internets, and there are numerous ways of preparing it. It is a highly savoury spread or relish that can be used in a multitude of ways. In the picture you can see a BLT toast sandwich prepared with bacon jam – much speedier than grilling bacon rashers. You can also stir it through rice or pasta for a frugal insta-meal, use it to top baked potatoes or spread over the bread of your fried egg sandwich. This recipe is my own, and very much from the That’ll Do™ School of Cooking, in that you can be as extravagant or as miserly as you like, with the ingredients that you have. You can also customise it to your own personal tastes – mine stretch to a few fresh red chillies to add a bit of feisty heat and to catch the eye, strong coffee, some Henderson’s Relish for sharpness and, contrary to a great many recipes, no added sugar (the kecap manis is sweet enough). Just because it’s called jam doesn’t mean you have to drown it in sugar. Call it a jam for all the things you can spread it on/in. You can choose any cut of bacon you like: streaky rashers, back bacon, smoked or unsmoked. Personally I buy cooking bacon as it is ridiculously cheap (less than £2/kg). Some supermarkets (Sainsbury’s) occasionally have packs of cooking bacon that contain the trimmings and ends of gammon joints, and if you turn the packs over and there is a hint of orange about the meat, then you’ve got some smoked bacon in the mix. Others are just filled with chopped bacon trimmings, so it can be worthwhile rummaging around, as each batch can vary. I cannot stress enough how much the recipe below is a rough framework. Got more bacon? Bung it in. Like caramelised onions? Add more. Garlic fiend? Shove a load in. I prefer to blitz my bacon jam in the food processor down to the consistency of pesto. It makes it much easier, not to mention quicker, when using it in other things, but you might prefer to keep it chunky, so the individual ingredients can still be discerned. Whilst this recipe WILL make some delicious bacon jam, it is what *I* consider delicious bacon jam, which might be quite far removed from what YOU consider delicious bacon jam. So you will probably need to tweak it to your own personal tastes. Below you will find a list of spices and relishes that you can add to find tune the basic recipe. There is no right or wrong way to make bacon jam – it it totally up to you and your tastebuds. Speaking of which, you HAVE to taste it as you go, and then decide firstly if it needs anything extra, and secondly, what that extra thing might be. Don’t feel you have to add 101 extra ingredients – it is, first and foremost, supposed to taste of bacon. Don’t lose sight of that. Another don’t – Don’t forget to write down what you add, as you might hit on a million pound winning combination and want to recreate it later! This and the next few recipes are my contribution towards festive baking and making – delicious additions to your own table, delightful as presents for others. I hope you enjoy! Bacon Jam should be warmed before use, to bring out the flavours. A quick zap in the microwave or toss in a pan is all it takes. 4 fresh red chillies, de-seeded and finely diced. Put the bacon into a pan and cook over medium heat. Use a spatula to break it up into smaller pieces. You can cook it as long or as short as you like, but I prefer well done, with specks of rusty caramelisation starting to appear, and the fat fully rendered. Lift the bacon from the pan with a skimmer and drain in a metal sieve. Add the onions and chillies and cook in the bacon fat ( for added flavour) until softened and caramelised. If you have a large excess of fat after the bacon has cooked, then drain some of it off, but I’ve never had that problem. Of course, this will also depend on the quantity of bacon you’re cooking. Return the bacon to the pan and add the rest of the ingredients. Transfer to a food processor and blitz until the mixture resembles a coarse pesto. If you think there is too much liquid, return to the pan and simmer gently until the excess has evaporated. Taste and add further flavourings as liked. Spoon into jars and seal. Add a layer of melted fat if liked, to aid preservation. Store in the fridge and use on everything. Right off the bat I’m going to admit that this is not an original recipe, but it IS one of my absolute favourite Christmas dishes. In fact, I like it so much, I make it even when it isn’t Christmas – it makes a fab meal all by itself, especially when served alongside some crunchy stuffing! My (English as opposed to Dutch) sister-in-law made it years ago and I managed to pry the recipe out of her clutches long enough to make a copy – The Precious! It’s from an old Prima magazine, and I’m sharing it today as a suggestion to making your Christmas that little bit easier and a whole lot tastier. To my mind, one of the best things about the traditional Christmas turkey meal isn’t the bird itself, it’s all the trimmings that go with it: bacon rolls, chipolata sausages, stuffing, chestnuts, cranberries, etc. However, on probably the most stressful day of the year foodwise, you don’t really want to be juggling all these itty-bitty bits on top of everything else, so here’s a fabulous and delicious solution: Trimmings Tart. All the traditional Christmas trimmings gathered together in a kind of savoury Tarte Tatin, with a balsamic caramel glaze and topped with crumbly, buttery, walnut pastry. Make it ahead of time and all it requires on the day is 20-25 minutes to cook the pastry and heat the filling – you could do that while the turkey was resting. 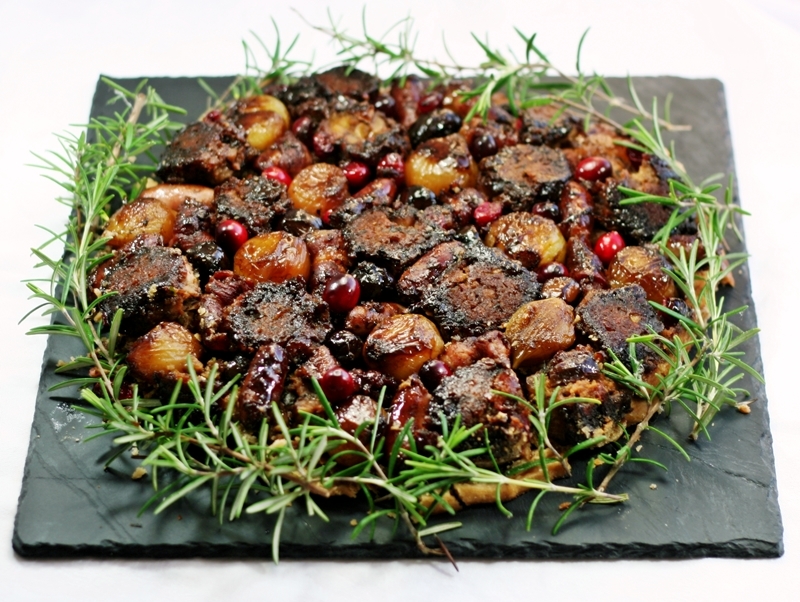 Turn onto a plate to serve and cover any crumbly edges with rosemary sprigs – it’s what I did! When I turned the tart out this morning, I forgot to loosen the pastry from the edge of the pan (not that the original recipe tells you to do that! ), and so it didn’t all come out smoothly. I’ve got to be honest, I actually toyed with the idea of dashing to the supermarket at 10am and buying more ingredients to make another one. But then I thought: No, hang on – what it this was Christmas Day? No shops open to fall back on, so some improvisation would be in order. And let’s be honest here, it’s going to be on the table for all of five minutes before people are ripping into it like a monkey on a cupcake, so no need to agonise over presentation too much. The original serving suggestion does actually include sprigs of rosemary, admittedly not quite as many as I used, but I think they make it look very Christmas-wreathy. The glaze is dark due to the balsamic vinegar, but I quite like that as it makes the red of the cranberries really pop. Feel free to use white balsamic if you can get it, or a mild wine vinegar to lighten things up. Use any mushrooms you like, but chestnut mushrooms won’t have lots of black juice oozing out, and will keep their texture. Fresh chestnuts are wonderful and give great texture to the forcemeat, but a little time-consuming to peel and cook. If you know you won’t be using them in anything else, you could buy them ready-prepared. Try and get good quality, lean bacon for the bacon rolls – otherwise there’s more faffing about trimming off the excess fat. Extra cranberries can be made into sauce with just a little sugar and water. Don’t roll your pastry too thin – there’s a hefty number of ingredients to support once the tart is turned out. This quantity makes just about a perfect amount of pastry for a 24cm tart. Put the flour, butter, walnuts and egg yolk into a food processor and blitz. Depending on the moisture in the flour and butter, the yolk might be enough to bind it together. If not, use 1-2 tbs cold water until it comes together in a ball. Knead the dough smooth, then cover in plastic and chill in the fridge. Peel the onion and garlic and chop them finely in a food processor. Melt the butter in a pan and cook the onions and garlic until softened. Chop the bacon in the food processor, then add to the pan and cook for a few minutes. Chop the mushrooms in the food processor, then add to the pan and cook for a few minutes to release the moisture. Add the breadcrumbs, pate, chopped chestnuts and herbs and mix thoroughly. Make the mixture up into balls using a tablespoon or a small ice-cream scoop to measure. Pour boiling water over the shallots and leave for 2 minutes. This makes them easier to peel. Peel the shallots and cook in boiling water for 5 minutes. Drain. Dry. Roll the bacon up and secure with cocktail sticks. Grill the sausages and bacon rolls. Heat the butter and oil in a pan and gently fry the shallots until golden. NB This should be the pan you will use to bake the tart, so make sure it has an oven-proof handle or one that can be removed. Alternatively, when the shallots are cooked, tip them and the glaze into a cake/tart tin. Add the sugar, balsamic and water to make the glaze and cook for a further 5 minutes until the liquid has reduced and thickened. Remove from the heat. Arrange the forcemeat balls, bacon rolls and sausages in the pan with the shallots. Add the cranberries to fill any gaps. Allow the filling to cool. NB If you’re making the tart ahead of time, then stop here. Cover the filling with clingfilm and keep in the fridge until required. Roll out the chilled pastry until just large enough to cover the filling. Lay the pastry over the filling and tuck round the sides. Bake for 20-25 minutes until the pastry is crisp and golden. Set the cooked tart aside for 10 minutes to cool slightly. Run a knife round the edge of the pastry to make sure it isn’t stuck to the pan. Place a plate over the pastry and carefully flip the pan over to turn out the tart. Gently lift the pan off, checking that none of the filling has stuck. If it has, use a slice to ease it from the pan and place it neatly back into its place on the tart. Cover up any pastry/filling disasters Garnish the tart with sprigs of rosemary.